The Miller Empey Natural Science Room, houses the Empey Collection for public education and observation. Understanding the importance of education, Mr. Empey arranged for his collection to be passed onto the Freeland Board of Education. The original interior of the museum, the show cases, and other original building materials, were made possible by the generosity of the Freeland Community. Area individuals and corporations realized the importance of this venture and continued to donate funds to help defray the expenses of operating the room. In continuing Miller Empey's vision of education: the Freeland SportsZone combined his collection with a computer library and a meeting room. 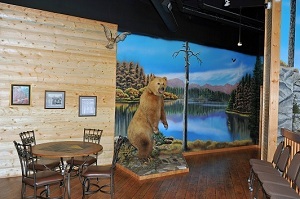 Made possible by a generous $1.8 million grant from the Miller Empey Natural Science Foundation, his gift to us is displayed with a beautiful re-creation of a natural environment, including a northern lounge and a two-story waterfall. Many thanks to the Timmons family for their stewardship of Miller's Collection.